Are the patterned openings to these storm sewer grates trying to tell us something? Some people look at them and see an odd jumble, others think a man’s necktie is being evoked for some strange reason, and still others see a fish in the middle of the pattern right away. Of course, once the fish is pointed out, most people will see it that way from then on. Then the next mystery is why? Again, it’s a head-scratcher for some, while some intuit the reason right away. The fish symbol alerts us to the fact that however murky the flow of water below us might look through these grates, the ultimate point of outflow is directly into our rivers, either the Ottawa or the Rideau. So the symbol is trying to tell us something. But does the City of Ottawa itself ever explain the meaning of its lovely fish grates? Not according to Riverkeeper Meredith Brown, who works to educate governments and citizens about the ongoing threats to water quality in the Ottawa Valley watershed. She says that unlike other cities in Canada who have signed up for the highly visible Yellowfish Road program, Ottawa largely leaves education around storm-sewer contamination to citizen-based NGOs like the Riverkeeper program, and lets its residents figure out the meaning of the decorated storm sewer drains for themselves. The grates themselves are not cast especially for Ottawa, but are set design available to any municipality. However, storm drains and service covers are not treated as mere off-the-shelf items everywhere. In fact, many cities use them as locations for public art, as a dozen or more Flickr groups can show. 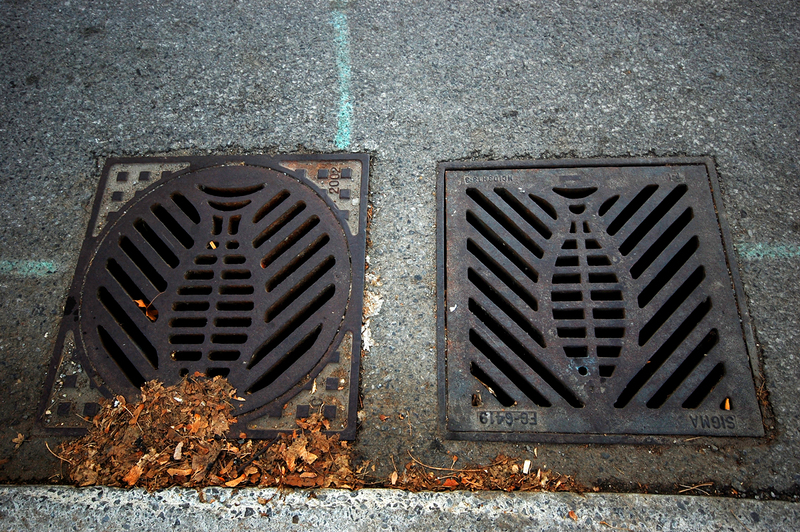 Ottawa used to have grates with large openings parallel to the roadway. These would catch bicycle wheels and send them flying. (Alternately, cyclists would swerve into traffic to avoid them–even though you shouldn’t be riding that close to the curb in the first place). You can still see some grates like this over the Macdonald-Cartier bridge, which is owned by Parks Canada (and not the City or NCC, like the other roads/bridges in the area). After pressure from cyclists (especially Citizens for Safe Cycling), the City used new grates which did not pose a hazard to cyclists. Initially, there were a few different designs, but as a cost-saving measure, the other designs were dropped and the fish design became the standard. These sewer grates are great examples of functional public art. They also seem to have that amazing quality to get better looking as they deteriorate. I sincerely doubt we will be able to say the same of the ill-conceived and poorly executed bike racks placed all along Bank St. this past week. The art on the racks mostly look like half made paper snowflakes i would have given up on as a kid and then to try to make a better one. I am not cutting down the artists, the limitations inherent in the project seemed to prevent any real expression. Plus, the bike racks themselves, although very wide, will only hold 2 bicycles – The same as a no parking sign or parking meter. Look to the Fish City of Ottawa! Form follows Function, we have now had a century to figure that out. The fish design was originally produced by the pre-amalgamated City of Ottawa, before amalgamation. They used to advertise the meaning of these sewers, but since amalgamation, they haven’t bothered to continue.